A close relationship with particular deities was an important aspect of regional identity in pharaonic Egypt. A close relationship with particular deities was an important aspect of regional identity in pharaonic Egypt. This worked in two major ways. The first was the idea that the region, specifically the nome, could be thought of as a personified deity. These gods and goddesses would have no name other than that of the region itself, usually displayed as a standard on their heads when they were depicted in two or three dimensions. These regional personifications had in fact no ‘personality’ or role in myth and seldom appeared as independent figures; rather they were used as a collective group of male and female (and often the sexually ambiguous ‘fecundity figures’) who together represented Egypt in its constituent parts. A triad statue depicting King Menkaure accompanied by the goddess Hathor and a nome deity representing the 4th Upper Egyptian nome (that of Thebes). Egyptian Museum, Cairo. These nome deities can appear in statuary accompanying the king, the best example being the series of triad statues from the pyramid complex of Menkaure at Giza, each showing the king flanked by the goddess Hathor and one of the nome gods, shown as a male or female figure: although now far from complete, it is reasonable to assume that the original series of figures represented the king with all the nomes of Egypt in turn. A relief showing a series of regional deities from the cenotaph-temple of Ramesses II at Abydos. Rutherford Picture Library. More frequently, nome gods are found represented in two dimensions: rows of these figures were often placed around the lower parts of walls of temples, particularly in the New Kingdom and Graeco-Roman Period. They are usually shown bearing agricultural produce from all the regions of Egypt as offerings to the god of the temple. These processions of nome deities could be expanded to include representations of towns and distinct regions that were not part of the canonical nome lists, so that contemporary important towns could be included as contributing to the offering-bearing. It is doubtful that these nome gods would have been of much interest to the population of the nomes themselves, serving instead as a representative of the nome in the greater assemblage of Egypt as the sum of its individual parts for the benefit of the king and the god(s) in whose temple they appeared and to whom their offerings were directed. It is noticeable that, in both these cases, the name of the town or district directly refers to one or more of the gods with whom it is associated. 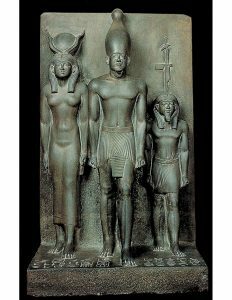 Hwt-Ka-Ptah, or ‘Mansion of the ka of Ptah’, refers to the temple area at Memphis sacred to Ptah, but was also used as a name for Memphis more generally (and, ultimately, was the source of the word ‘Egypt’). Khmunu, or ‘Eight-Town’, refers to the eight primordial gods who appear in the local version of the creation myth: the toponym Hermopolis Magna is the name for the city in the Graeco-Roman Period, deriving from a perceived identification between the Egyptian god Thoth and the Greek god Hermes. Of course the most important member of the elite ‘scribal class’ was the king himself. He was in the best position to make manifest the position of a deity within the city by creating monuments for him or her. 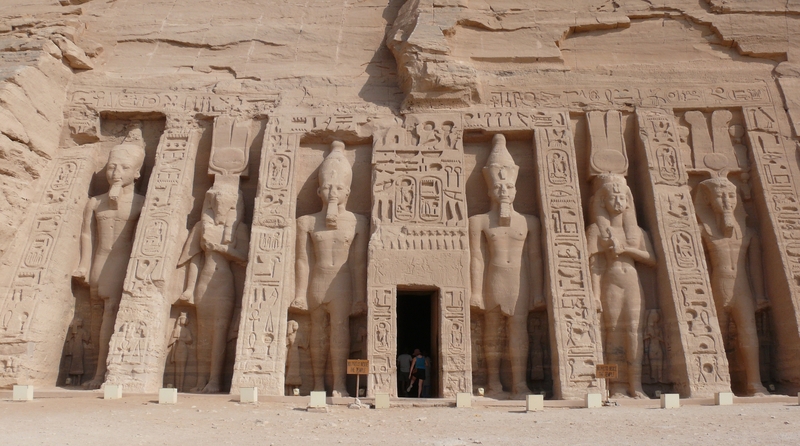 The vast majority of all surviving temples from ancient Egypt is the work of kings, either in embellishing or replacing ‘local’ structures with more impressive buildings, which only royal resources could create, or in the initiation of immense building projects. Whatever the scale, the intention was the same: by providing for a local god, the king was displaying his concern for local religious practices and bringing royal resources in materials and skills to a regional centre, but he was also making manifest the unique relationship between the king and all the gods of Egypt. Only the king could have this special connection with the gods, only the king was depicted approaching the gods and only the king could be regarded divine himself. Of course, it may be that our evidence is skewed. We do not have any surviving examples of what a temple in a small town in ancient Egypt would have looked like any more than we know what that small town itself would have looked like. It may be that, away from significant centres of local political and economic power, temples were indeed built by local people to worship local gods and were made from local materials (i.e. mudbrick rather than stone) and would have looked similar to the ‘preformal’ temple at Medamud, but one might suspect that the regularization of form that went along with royal involvement in the Middle Kingdom and later, if not before (again Medamud is the most telling example), was the norm in any town of any size anywhere in the Nile Valley or Delta. 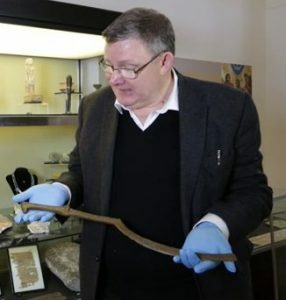 However, this question of royal involvement must not distract us from what temples were actually for, and how they might have contributed to the life of the towns and cities within which they were built. The first thing to note is that gods were thought of as literally inhabiting the temples built for them. The most common words for temple, pr-nṯr (per-netjer) or ḥwt-nṯr (hwt-netjer), refer to a ‘house’ for the god in the same terms as a ‘house’ for any other person. The god’s presence was located in the image – usually a statue – that was housed in the innermost part of the temple, the sanctuary. Divine worship consisted of rituals – the regular offerings of food, drink and incense, together with a change of clothing – performed by priests on and for the divine image. This was very much in parallel with the service provided to a member of the elite by their servants, indeed the most common term for a priest was ḥm-nṯr(hem-netjer), literally ‘god’s servant’. Congregational worship was not the norm, since temples were built as houses for gods, not places where worshippers came together for divine service in which priests directed the congregation in praise of an invisible god. 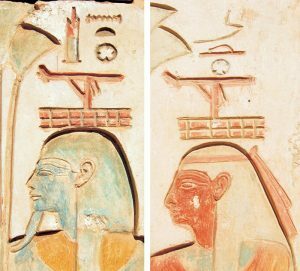 The texts above the heads of these regional deities identify them as personifications of the towns of Dendera (left) and Medamud (right). Rutherford Picture Library. 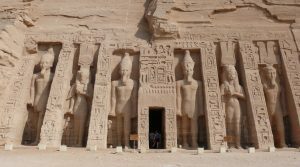 Therefore Egyptian temples were not primarily structures by which a distant god was contacted by a local population (although they could, as we shall see, have that function too), but real houses. Huge, magnificent, heavily decorated stone houses in many cases, but houses nonetheless, located in towns and cities alongside the houses of the other local residents. Moreover, as the most important resident of the town, the house of the god often had a central location. Indeed in major cities, certainly in the New Kingdom, the temple was the core around which the city grew. 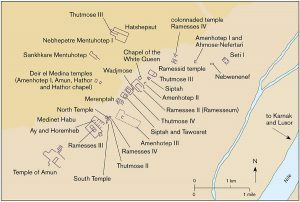 Although it is common to speak of places like Amarna, Pr-Ramesses and (to a lesser extent) Thebes and Memphis as ‘royal cities’ based on the main influence on their building, it would also be accurate to speak of them as ‘divine cities’ since the god(s) within them were the most important resident and their dwellings the most important structures. The exclusive nature of major New Kingdom temples, usually only accessible to the king and his nominated proxies, the professional priesthood, might suggest that these structures, although the dominating architectural presence in a city, were essentially isolated from it. This is only partially true, for two main reasons. First, these major temples were hidden behind the massive mudbrick walls of the temple enclosure – an ‘urban citadel’ that was not simply sacred space, but also contained a series of other important structures requiring regular access, such as palaces, workshops, storage facilities and, sometimes, housing. Secondly, while the great doors of these temples were usually firmly closed, they could be opened to a wider public, most notably on special occasions when divine festivals offered the opportunity for centrally organized events in which the whole community could participate. The most public aspect of these festivals would be procession, when the divine image was taken out of the temple and brought into the sphere of the city-dwellers as a whole. 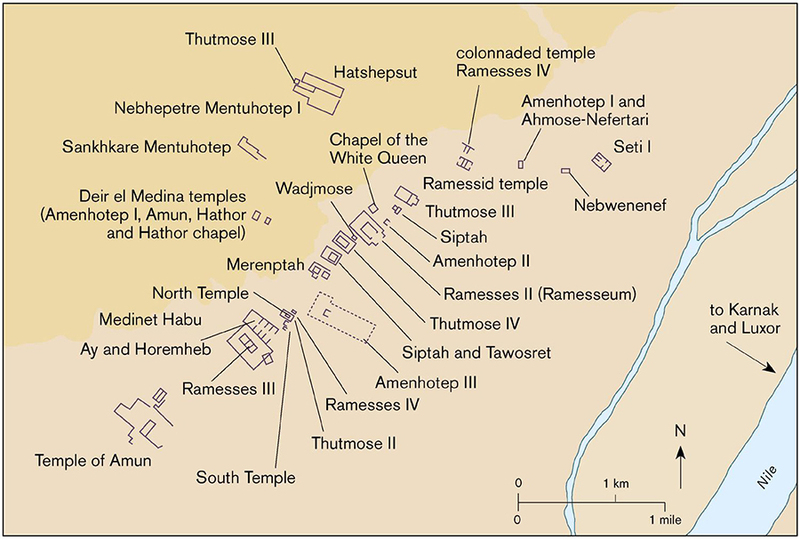 The landscape of the Theban West Bank during the New Kingdom was dominated by royal mortuary temples. Steven Snape. The specific nature of the procession and events connected with it would depend on the town in which they were carried out. Those at Thebes are the best known, with the images of the god Amun and his family leaving their ‘home’ at Karnak in order to process southwards to the satellite temple of Luxor (the ‘Southern Harem’ of the god) in the annual Opet Festival, or to travel across to the West Bank of the Nile to visit royal mortuary temples in the ‘Beautiful Festival of the Western Valley’. Both of these festivals involved processional routes that crossed or travelled along the Nile, and also went overland. For the latter, the overland processional route between Karnak and Luxor temples was provided with a paved road, lined with sphinxes and regular barque-chapels where the processional boats of the gods could rest. 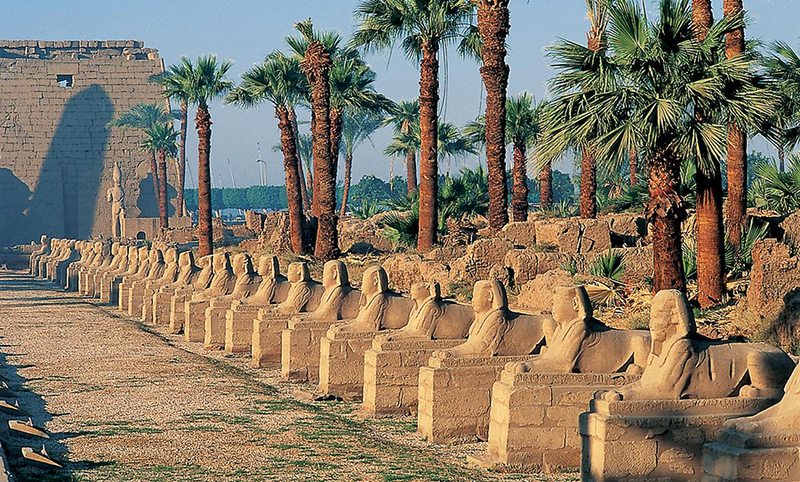 An additional effect of the creation of this avenue was to provide a physical ‘spine’ for Thebes – the fixed elements (certainly from the late 18th Dynasty onwards) were the Karnak complex in the north, Luxor Temple in the south and the processional avenue linking the two. Everything else had to fit around this ‘spine’ and it became increasingly substantial as successive kings sought to display their devotion to Amun by adding to his ‘house’ at Karnak and, to a lesser extent (but notably under Amenhotep III and Ramesses II), to the Luxor Temple. An important part of the monumental ‘skeleton’ of New Kingdom Thebes was the processional route linking Karnak with Luxor Temple. Heidi Grassley © Thames & Hudson Ltd., London. The West Bank of New Kingdom Thebes was also dominated by a series of massive temples linked to the river by a series of canals. These were royal mortuary establishments, built by individual kings to celebrate their divine kingship and their relationship with Amun and the gods of the afterlife. For other major cities, the dominating role of temples and temple-enclosures as physical features is clear, although more difficult to define precisely than that at Thebes. 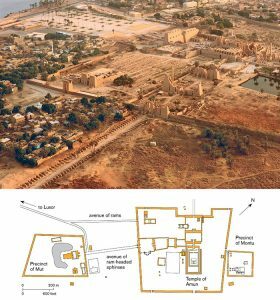 Our understanding of the great cities of Memphis, Amarna, Hermopolis Magna, Sais and Pr-Ramesses is that their temples were central to the town-planning that took place there. 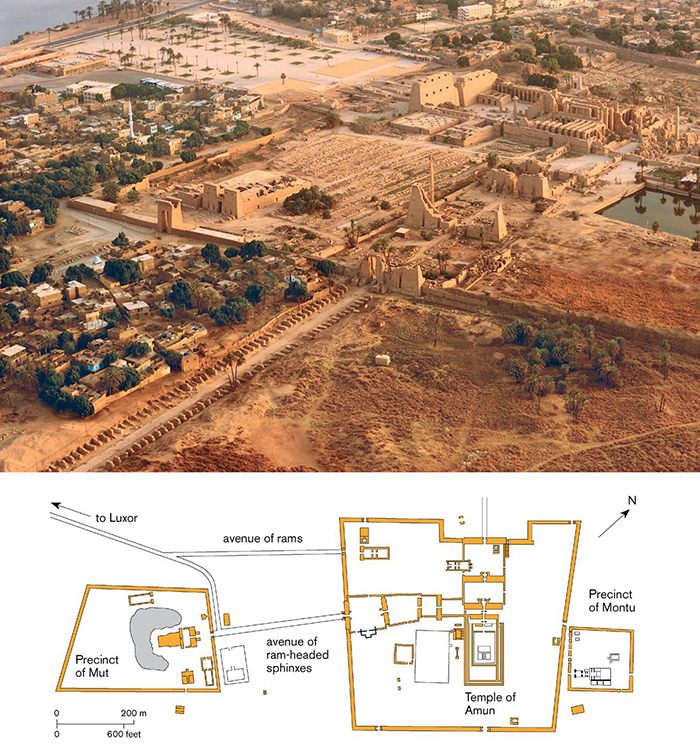 Aerial view of Karnak from the southeast showing the beginning of processional routes to Luxor Temple and to the temple complex of the goddess Mut, with a plan showing the relationship between the Amun and Mut temples. Kenneth Garrett/National Geographic Creative. Having described the royal, defensive and divine aspects of Egyptian cities, we shall now turn to consider them from the perspectives of their most numerous inhabitants: the people who built the cities, lived in them and recorded them for posterity in models and texts, and also in the remains they left behind to be found by archaeologists. For these were, above all, cities for – and of – people. From The Complete Cities of Ancient Egypt, by Steven Snape (Thames & Hudson, 09.16.2014), published by Erenow, public open access.